Urban Wood is wood from urban forests. Trees face a variety of challenges when growing in an urban environment, often coming with unique shapes, sizes and grains that make them desirable for designers and makers of special wood products. Urban wood comes from these trees that die of old age, diseases and pest infestations, or which need to be removed for safety or development reasons. In many cases this wood is considered a waste and its disposal is a cost to the homeowner or to the community; but this does not always need to be the case. LEAF is working with the City of Toronto and other key stakeholders to increase the utilization of wood from urban trees in Toronto and Southern Ontario. This Urban Wood Utilization Initiative seeks to encourage the salvaging and re-use of what we consider a valued urban resource to celebrate the intersection of urban and natural, create unique Toronto wood products and recognize the value and importance of urban trees to our city and its residents. This page is your place for Ontario events, workshops and resources related to urban wood. We’re updating it as new opportunities arise, so stay tuned! This section of the LEAF site is supported by the City of Toronto - Economic Development & Culture. Your source of information on the businesses that turn Toronto's waste wood into a valuable resource. If you’re a business in the GTA and provide one of the services listed in this directory then you can get listed in the next issue of the directory by emailing your contact details and a brief description to greentech[at]toronto.ca. NeighbourWood! Reclaim Trees. Reduce Waste, Create Beauty. An educational flyer that promotes the local wood industry in Toronto. Attention arborists, tree service companies, community groups, etc. - copies of this flyer are available to give to property owners removing urban trees. If you are interested in receiving a free packet of 50 flyers please send your request to greentech[at]toronto.ca. Looking for someone to assess or remove a tree on your property? Check out this map to find a company near you! We recommend getting quotes from at least three different firms, if possible - check out our handy guide to selecting a tree care firm for more tips. Please note, the above markers indicate data provided by Google Maps, and do not reflect the opinions or recommendation of LEAF or the City of Toronto. This LinkedIn group is for members of Toronto's local wood industry including arborists, sawyers and wood crafts people who are interesting in turning the dead wood in Toronto into valuable products. Chicago Urban Wood Utlilization, John Lough, Senior City Forester, City of Chicago. from Clean Air Partnership on Vimeo. On July 19, 2013, a storm brought down an aged silver maple tree on Laing Street in Toronto's Leslieville neighbourhood. This famed maple tree was the inspiration for the song "Maple Leaf Forever" by Alexander Muir, written in the year of Confederation 1867. A comprehensive catalogue of items made from the Maple Leaf Forever tree. A plaque made from the MLF wood has been made to commemorate the distribution of the wood from the Maple Leaf Forever Tree to projects across Canada held at Todmorden Mills on June 7, 2014. The plaque will be given to Todmorden Mills as part of their permanent collection. The plaque was made by the Toronto Tool Library. Our Forest Hall offers a wonderful opportunity to showcase this piece of Canadian history – it fits thematically with our intentions and would be seen by hundreds of thousands of visitors each and every year. The Forest Hall exhibition space focuses on forests and trees, with an emphasis on our local forests. Taking advantage of our location within the Don Valley, our goal is to provide visitors with the opportunity to make connections between the world outside our building, as well as their own backyards and neighbourhoods. We will use cross sections of the stem and branch for the display. The Ontario Wood Carvers Association is working with the Ontario Science Centre to host the carving of a large stem piece of the tool with panels on the history of Toronto. The totem will be on permanent display at the Ontario Science Centre when completed. LEAF worked with the City of Toronto, the Green Living Show and Ontario Wood on a design exhibition and auction. Unique designs, submitted through a competitive process and selected by a panel of judges, were crafted by local artists using wood from the Maple Leaf Forever Tree. A portion of the proceeds from this project will support LEAF's urban forestry initiatives. The auction is now closed. Thank you to all of the designers who participated! Read our designer guest blogs that explain the process of crafting their pieces. Learn more about why LEAF is interested in promoting better use of urban wood. View some of the designs made from the tree and celebrate a little bit of Canada's heritage. Tuesday, February 17, 2015 from 5:00 p.m. to 6:30 p.m.
Sunday, Feb 15 - 12:00 p.m. - 5:00 p.m.
Monday, Feb 16 - 12:00 p.m. - 5:00 p.m.
Tuesday, Feb 17 - 9:00 a.m. - 7:00 p.m.
Wednesday, Feb 19 - 9:00 a.m. - 5:00 p.m.
Click here for photo galleries showing the Maple Leaf Forever tree - from salvaging the wood to milling to making the beautiful final products! Consult this guide to learn how the wood will be used and how you can obtain a piece! This Facebook page is dedicated to identifying opportunities to use the salvaged wood of the tree to preserve its cultural and historic legacy. This report follows up on the direction by City Council at the October 8, 2013 meeting to report back to City Council on the final allocation and uses of the salvaged wood from this tree. This report was adopted by Council on September 30, October 1 and 2, 2015. 30-March-15. Toronto Star. "Alexander Muir's majestic maple tree finds new life." 24-March-15. InsideToronto. "Here's your chance to purchase a piece of Canadian history." 4-March-15. Ottawa Citizen. "The Maple Leaf Forever: tree that inspired song keeps on giving." 15-February-15. CTV News. "Maple Leaf Forever tree lives on through momentos, now on display at city hall." 11-February-15. Toronto Star. "Mementos of Maple Leaf Forever tree go on display at Toronto City Hall." 2-February-15. Beach Mirror. "Designs from Leslieville's 'Maple Leaf Forever' tree to be auctioned off March 27 to 29." 18-July-14. InsideToronto. "Art worked created from Maple Leaf Forever tree unveiled at MJG Gallery on Queen Street Saturday." 07-June-14. Toronto Sun. "Maple Leaf Forever Tree given new life at ceremonial planting." 07-June-14. Toronto Star. "Legendary maple leaf forever tree will live forever." 08-March-14. CBC The National. "Maple Leaf Forever." 08-March-14. Toronto Star. "Felled Maple Leaf Forever tree’s legend will live on." Linda Barnard. 05-March-14. Beach Metro. "Leslieville’s ‘Maple Leaf Forever’ tree set to live on in pieces of art." Joanna Lavoie. 22-January-14. Skedline. "Famous fallen tree inspires innovations with wood." Deanna Grant. 22-January-14. Bloor West Villager. "Fallen, famed tree becomes work of art in Maple Leaf Forever exhibit." Lisa Rainford. 21-January-14. Beach Metro Community News. "Finding a good use for damaged trees." Andrew Hudson. 17-January-14. Ontario Today. "Gardening: Maple Leaf Forever tree takes on a new life." Rita Celli. 17-January-14. National Post. "Felled 'Maple Leaf Forever' tree gets new life." Peter Kuitenbrouwer. 25-July-13 - Toronto Star. 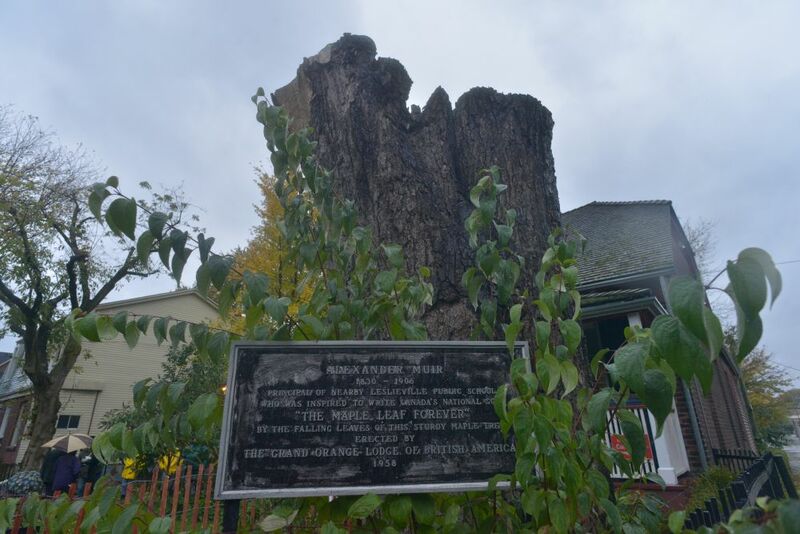 "City to Repurpose Historic 'Maple Leaf Forever' Tree." 03-July-13 - CBC Metro Morning. "Dead Trees." Matt Galloway. 01-July-07 - Logging and Sawmilling Journal. "Urban Wood." 28-January-14 - LEAF Blog. "And flourish green o'er freedom's home." Matthew Higginson. 14-January-14 - LEAF Blog. "What TO DO Next Week." Robyn Stewart. ...more Urban Wood Utilization Media & Promotion here.